Important note: The article below is an intro to Optimal EFT, a process that involves (1) the understanding of unique spiritual principles as well as (2) the skillful use of The Gold Standard (Official) EFT Tapping Tutorial™. 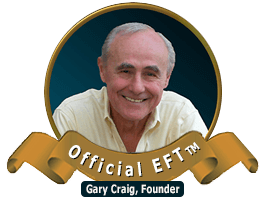 These will be unfolded in an ever expanding segment of our advanced material within Gary Craig's Official EFT Tapping Community. This subscriber-based Community is designed for professionals and serious students who wish to learn EFT at its highest levels. It is this audience for which this high level of EFT is most appropriate. If you are already an EFT Community member, login here to go directly to the expanded Optimal EFT segment. If not, read the article below and click here for more info. Below are videos of my keynote address at an ACEP (Association for Comprehensive Energy Psychology) conference. They give life to the New Psychology (Optimal EFT™) concept by bringing it off the written page and onto your video screen. It was welcomed by a standing ovation and I hope you greet it with similar enthusiasm. We are opening magnificent doors here into new rooms in our Palace of Possibilities. For your viewing convenience, the keynote address is divided into three videos.